Welcome to the latest segment in our Eye on Curriculum series. In honor of Reading Awareness Month, the March topic is Language Arts. As we did with our Common Core posts, this month’s articles will focus on curriculum discussion and classroom activities, as well as creative teaching extras, supporting sections on the site, and guest posts from abcteach staff and colleagues. • Language Arts – When exploring this section, you’ll find a number of supporting sub-categories for students of all ages. They provide you with a variety of topics and activity types, and include core basics such as grammar, spelling, and writing. To find to the specific topic or worksheet you’re looking for, use our filter tool to search within each category. • Reading – The Reading category is one of the largest sections found within Language Arts. Here you’ll see a broad selection of supporting items, including book report forms, first sentence prompts, phonics, reading logs, and more to pair with classroom reading, homework text, and other literature exercises. • Book Units – Find your favorite! We’ve got everything from Amelia Bedelia to Beatrix Potter, Dr. Seuss, Berenstain Bears, Clifford the Red Dog, and other great classics. Each series has a compilation of puzzles, posters, report forms, vocabulary games and other activities to reinforce key skills and details. • Reading Comprehension – Our Reading Comprehension section is broken down by grade clusters for easier navigation. The clusters contain fictional, informational, and holiday/seasonal stories, along with corresponding study questions to aid with comprehension. You’ll also find a functional text category full of recipes and crafts to do in class or at home. • Common Core English Language Arts (ELA) – Our ELA section provides grade-specific worksheets, activities, and instructional posters that match the requirements for each skill domain. This is one of our newest sections, so check back for new additions. We are also working to classify materials across the side to align with their correct section number strand. Take a look at our last Eye on Curriculum blogs for a review and activity ideas for literature and informational text. These are just a few of the many sections to support your language arts lessons during the month and throughout the year. Stay tuned for more great ideas as we explore other abcteach categories and classroom creatives. 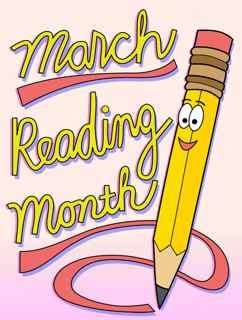 Happy Reading Awareness Month!